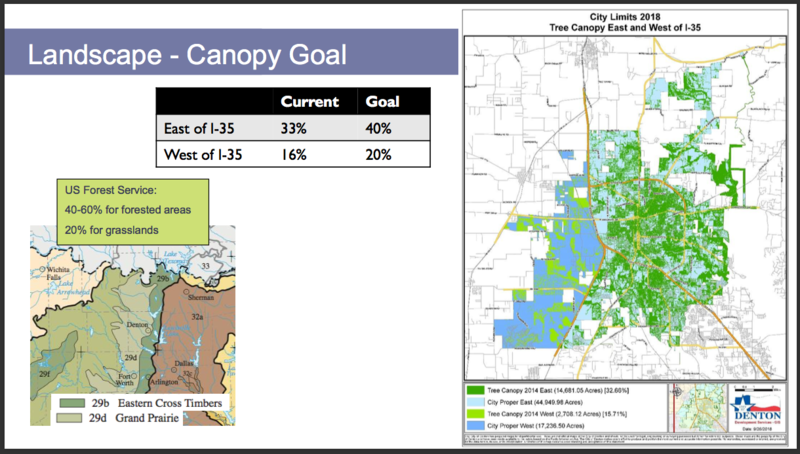 Our current Tree Preservation and Landscape Standards, a component of the Denton Development Code, were adopted in 2004 for the purpose of promoting tree preservation and to facilitate site design and construction standards that would allow for the long-term viability of Denton’s trees. Over time it has become evident that while the current regulations protect some of the city’s existing tree canopy, more is needed to manage and maintain essential tree coverage and to provide clearer guidance for preservation and mitigation efforts. The proposed Conservation and Landscape Standards are intended to replace the existing Tree Preservation and Landscape Standards and offer a more comprehensive set of regulations that address landscaping, tree preservation and loss mitigation, and environmentally sensitive areas. A broad spectrum of citizens and stakeholders within our community have made calls for improvment to our Tree Preservation and Landscape Standards since 2012. Improving on this code and creating easier to understand, easier to enforce, and more effective policy for tree canopy protection and loss mitigation was an important issue to me personally well before I took office. It has taken time to build the momentum in City Hall necessary to address the shortcomings of the current Tree Preservation and Landscape Standards. While this proposed code does not reflect everything that I advocated for, I am proud to have served as the Chair of the Committee on the Environment alongside fellow council members both past and present to help develop these proposed Conservation and Landscape Standards. We look forward to your feedback. The City of Denton has applied for a permit for landfill expansion. During the permit review period you have the ability to provide feedback by visiting http://www14.tceq.texas.gov/epic/eComment/ and entering permit # 1590B. We need to continue support the development of more efficient and effective landfill divergence. This includes our recycling programs where we as citizens need to reduce the amount of non-recyclable contaminates we place into our recycling bins while increasing the amount of recyclables we put into our bins. We as a city need to expand our recycling collection to include both commercial and multifamily residential service. We need to look at ways to develop a composting program for food waste. We also need to put an end to the policy which allows other communities and commercial waste companies to dump their waste in Denton. I know that we (the City Council) need to have very real policy discussions on each of these items. We should be spending more or our time and energy developing plans and policies that will significantly reduce the amount of additional waste that we put into our landfill rather than solely rely on a plan which would allow us to expand the height of the landfill up to 213.5 feet above ground level. 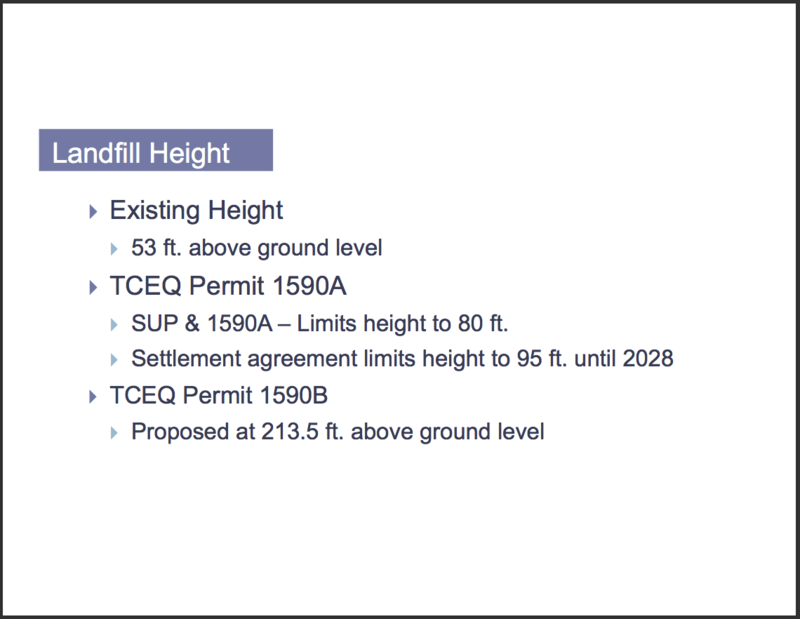 Please note, that even though the proposed TCEQ permit would allow expansion up to a height of 213.5 feet after the year 2028, it doesn’t mean that this City Council or future City Councils have to allow our landfill to maximize to that height (we can put tighter restrictions on ourselves). 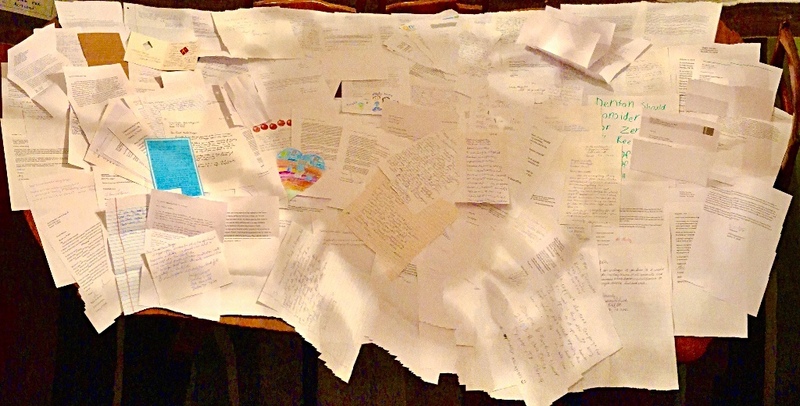 I have hundreds of letters that have been sent to me from citizens, many within District 2, who appear to agree with taking an approach of maximizing strategies of landfill divergence. This can make economic and environmental sense. Let’s do what we can to make it a community goal to not have a 200 foot mountain of trash as a landmark on our horizon. Below is a list of Food Resources and Thanksgiving meals available in the community. Please share this information with those who may need assistance with meals during this Thanksgiving holiday. Thanksgiving Community Banquet – Calhoun Middle School, 709 Congress Street, Denton Thanksgiving Meal served Thursday, November 22, 2018, 11:00 AM – 1:00 PM. All are welcome! Phone: 940-382-8888. Thanksgiving Community Dinner – First United Methodist Church Denton – Thanksgiving meal served on Thursday November 22, 2018 from 11 a.m. to 2 p.m at 201 S. Locust St. For more information, call 940-382-5478. Asbury United Methodist Church, Location – 117 Hercules Lane, Denton, TX 76207, Phone number – (940) 387-6487. Open on Mondays 10am-12pm and 6pm-8pm. Our Daily Bread. Lunch provided Monday- Friday 10:00 am – 1:30 pm, Dinner Mondays 5:30-6:30pm, Saturday lunch 10:00 am – 12:45 pm Phone: 940-382-5604 Location: Kitchen and Fellowship Hall of Saint Andrew Presbyterian Church, 300 W. Oak St., Suite 100 in downtown Denton, TX. Salvation Army 940-566-3800, 1508 E. McKinney St., Denton Provides a food pantry Wednesdays and Fridays from 1:00 p.m. to 3:45 p.m.
Mr Chopsticks – On Thanksgiving Day from 12 to 2 pm Mr. Chopsticks staff members are going to be cooking free meals for those who are hungry and in need. So if you know someone who might be hungry and have no place to go, tell them to come over for a hot meal for free. Mr. Chopsticks is located at 1633 Scripture St. Please have a safe and happy Thanksgiving.